FILE - A Pro-Russian activist waves a Donbas Republic flag over a crowd celebrating the capture of an administration building in the center of Luhansk, Ukraine, one of the largest cities in Ukraine's troubled east, April 29, 2014. Ukraine's parliament has passed a bill that backers, including President Petro Poroshenko, say will help Kyiv restore control over areas in the east that are held by Russia-backed separatists. The bill, which has been the subject of tension and demonstrations in a country whose stability has been undermined by nearly four years of war, was adopted with support from 280 lawmakers in the 450-seat Verkhovna Rada on Thursday. It goes to Poroshenko, who backed the legislation and celebrated its passage in social-media posts after the vote. "We will continue to pave the way for reintegration of the occupied Ukrainian lands through political and diplomatic steps," Poroshenko wrote on Twitter. ​The bill labels Russia an "aggressor" and the separatist-held parts of the Donetsk and Luhansk provinces — part of what is known as the Donbas — as "temporarily occupied territories." That is the same designation given previously to Crimea, the Black Sea peninsula that Russia seized in 2014. FILE - Ukrainian President Petro Poroshenko speaks at a press conference in Tbilisi, Georgia, July 18, 2017. 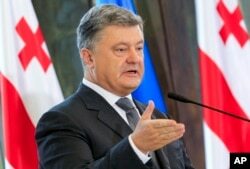 Poroshenko was on an official visit to Georgia. In his tweet, Poroshenko called the bill's passage "a signal for the Donbas and for Crimea: You are an inseparable part of Ukraine." The bill makes no reference to the European-backed peace deal known as the Minsk accord, leaving questions about whether it could further complicate efforts to implement the February 2015 agreement aimed at ending the war in eastern Ukraine. The pact obliged Kyiv to adopt legislation granting substantial autonomy to the separatist-held regions — an idea that has come under fire from many politicians in Ukraine. Separatist leaders in eastern Ukraine and pro-Kremlin politicians in Moscow claimed that the bill would badly undermine the Minsk pact, whose implementation has been described by the United States and the European Union as a condition for lifting sanctions against Russia. "Kyiv has gone from sabotaging the Minsk agreements to burying them," said Konstantin Kosachyov, chairman of the foreign affairs committee in the Russian parliament's upper house. The Russian Foreign Ministry later said in a statement, "You cannot call this anything but preparation for a new war," and warned that the bill "risked a dangerous escalation in Ukraine with unpredictable consequences for world peace and security." Language regarding the Minsk accords was removed after much debate ahead of the first reading of the bill. More than 10,300 people have been killed in eastern Ukraine since April 2014 in the conflict, which erupted as Russia fomented separatism after Moscow-friendly President Viktor Yanukovych was pushed from power by huge pro-European protests in Kyiv. The Ukrainian military said Thursday that one soldier had been killed in eastern Ukraine in the previous 24 hours. The bill supports a ban on trade and a transport blockade of the east that has been in place since 2017. Under the legislation, the only separatist-issued documents that Ukraine would recognize are birth and death certificates. The Associated Press cited Volodymyr Fesenko, head of the Penta research center think-tank in Kyiv, as saying the main purpose of the bill is to defend Ukraine's interests in international courts. Ukrainian political analyst Kyrylo Sazonov told RFE/RL that the bill "puts a trump card into the hands of our diplomats in international negotiations."